"leaves me grasping for superlatives"
Stephen Sondheim's popular Broadway musical 'Sweeney Todd: the Demon Barber of Fleet Street' returned to the West End in a glorious new production direct from a sell out run at the Chichester Festival Theatre. This gruesome tale features an impressive and memorable score, and was brought to life expertly by Michael Ball and Imelda Staunton, who both took home Olivier Awards for their efforts. Loved by critics and audiences alike, this was a spectacular and memorable production at the Adelphi Theatre London. Thank You for the show it was fantastic. I loved each and every moment. I am a great fan of this musical, but I can say that this performance was the best I ever saw. I suggest to everyone to go and see the show, because there is only one more week left. Saw this show on Saturday night (07/09/12) and it was brilliant! All the of cast members were fantastic but Michael Ball and Imelda Staunton were outstanding! Definitely one of the best shows I've seen in London. Amazing show, actor and production. The chemistry between Michael Ball and Imelda Staunton, so real. I am so glad I went to see this before it closes. We have seen this production in Chichester and London and look forward to seeing the last performance on the 22nd September. We think the performance of the whole cast is stunning and anyone who has doubts it is really great to capture the performances of Michael and Imelda also the young talent of Luke Brady. This will make it three and a half times we have seen the show buts that's a different story. Just got home after watching Sweeney Todd. Imelda Staunton and Michael Ball were astounding, especially Imelda Staunton. The rest of the cast were also wonderful. Fantastic. Saw the show tonight (6/6/12). What a fantastic show. Having already fallen in love with the musical score, I was so excited about seeing the show. Michael Ball was his usual brilliant self, but I have to say Imelda Staunton steals the show. Fabulous! We have already been to see Sweeney at Chichester twice and we have now been to see it AGAIN now it has reached London. It hasn't lost anything from being in the round, in fact we noticed different things happening on stage seeing it from a different angle. We can't get enough of it! Michael Ball and Imelda Staunton are stunning, as are the rest of the cast. I hope the show wins plenty of awards because they deserve it. Michael you are amazing and all your fans will keep on going to see it as long as you want to do it! Look forward to seeing it again in September. Saw it last year, it was amazing! Michael Ball made it all the better, I have seen Sweeney Todd twice and he played it the best. Saw Sweeney Todd on Saturday, It was wonderful, both Michael Ball and Imelda Staunton were amazing. Can not wait to go to see it again. 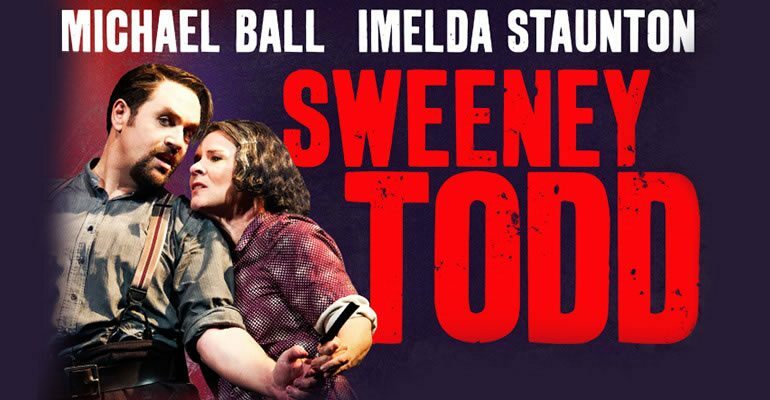 Michael Ball is electrifying in this new version of Sweeney Todd. I have seen it twice in London in row F and I am seeing it again in April. This is an incredible production and I will see it again and I am recommending it to everyone I know. Imelda Staunton has to win awards for her performance.